I woke up today, and as I went into the bathroom, the strangest thing happened to me. I looked up, and suddenly, from the shinny, silvery surface of the mirror, I just couldn’t recognize the image staring back at me. Anyone else could have sworn that it was me, my reflection. But I know better, and those eyes, distant and cold, were just not mine. The mouth, the nose, every single hair. It looked like me, but I know who I am, and the sharp dark glance that those eyes had were completely alien to me. I closed my eyes, splashed some cold water on my face. I looked up again, and then I saw the grin. A mocking, askew smile plastered on that face that should have been mine. I was so stunned I touched the tip of my fingers to my own lips. 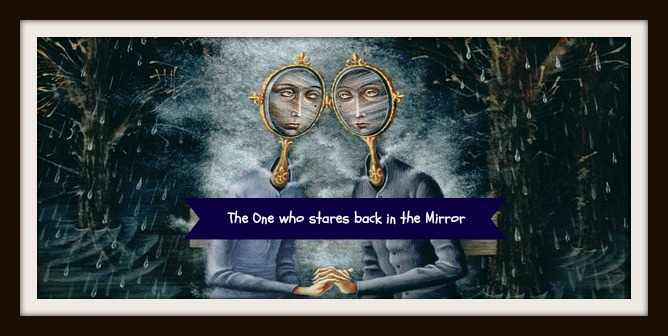 The stranger in the mirror did the same, but the cruel grimace in that mouth did not belong to me. I ran my fingers through my hair, down my face, feeling every muscle, each line that made my face. The evil double in the mirror did the same, staring me down, fixating those dark pupils on my every move. Slowly, tentatively, almost magnetized by that black glance, I reached for the surface of the mirror. A little. Then a little more. My fingers touched the silvery pool, and a hand shot out from inside and dragged me in and away forever. NOTE: THIS TEXT WAS WRITTEN AT THE CREATIVE WRITING WORKSHOP I’M CONDUCTING THIS SUMMER, AND IT IS BEING PUBLISHED AS WRITTEN, WITH NO EDITING. SORRY FOR THE GRAMMATICAL MISTAKES!! THE PICTURE IS A PAINTING BY REMEDIOS VARO, AND DISPLAYED AT THE MUSEUM FOR CONTEMPORARY ART IN MEXICO CITY.